Welcome to my web page! Since the vast majority of the costuming that I do at this point revolves around my involvement in the SCA, I've chosen to focus on that particular hobby. In the SCA, I am known as Mistress Philippa Montague. 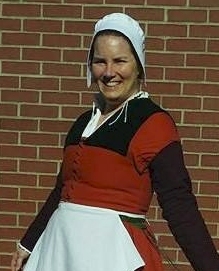 I joined the SCA in November of 2006, because I was interested in attending The Known World Costume Symposium. I had friends who were in the SCA, but had never gotten around to joining up until then. I dragged my husband to Madison, WI to attend this event. He wandered off to watch a fighter practice, while I attended classes. We were both hooked! He found our local group of fighters, and chose to learn rapier. We have become members of a group in the Chicago area known as the Thieves of Hearts, which is primarily a rapier household, though there are members who are interested in almost everything from heavy combat to archery, illumination to brewing, and so on. Our home shire is Ravenslake, where we hold officer positions and are involved in the running of events and other activities. My primary focus has been costuming, which has been a passion of mine for many years, and which is the activity that led me to the SCA in the first place. I have created a full wardrobe of clothing for my own family, as well as numerous outfits for others within my circle of friends. I have found other costumers' blogs, dress diaries, class materials and websites very helpful, and have decided to put much of my own work out there for others to view and refer to. Almost all of the photographs were taken by myself or my husband, and the class materials were written by me. I would appreciate a reference back to this website if you make use of these. The class materials themselves contain copies of portraits and books that I have referenced for research purposes.